WADR, a radio station set up to promote and defend the ideals of democratic, open, and transparent societies in West Africa, have developed a hybrid approach to distributing their audio content. One outlet is their website (www.wadr.org), which widens the broadcast coverage beyond West Africa, allowing more outreach to the African diaspora and the rest of the world. Two tools, developed by Sourcefabric, have helped WADR achieve its goals. The first is the newsroom content management system Newscoop, which acts as a publishing platform and front end for www.wadr.org. 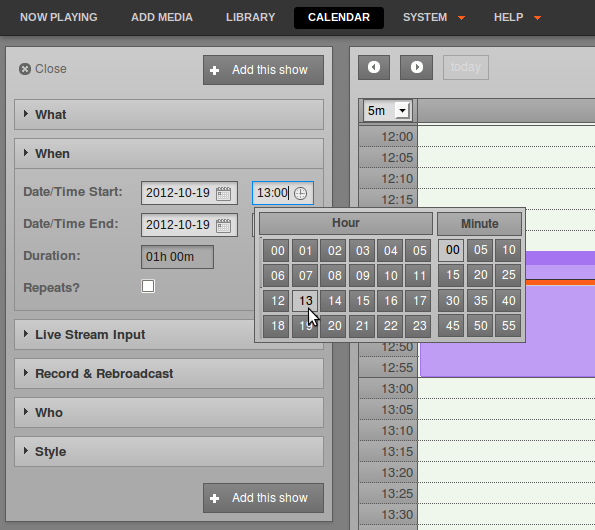 The second is Airtime, an open source radio scheduler and automation system. With these tools, WADR is able to schedule and publish reports in French and English online, on air and on social media sites. This case study will focus specifically on Airtime. WADR wanted to remove the duplication of effort needed to create multiple outlets for their content. The station was focused on transmitting radio via the airwaves, and was limited in the amount of audio it could make available online. If programs were made available there was a long delay as audio was extracted from archives, then digitised and uploaded. They needed a solution that would allow them to digitise their programs and enter descriptions of the audio content. That information and audio data would also need to be easily portable across the different online platforms of the station. WADR chose open source software for their own platform, but a commercial service for hosting their audio. They chose SoundCloud -- a cloud-based audio host -- for its extensive API, embeddable players, waveform comments system, ease of integration with social networking sites and vibrant community. To reduce file management, WADR use Airtime -- a program which enables them to record shows, as well as enter the details of each show as they record. A simple checkbox then allows direct transfer to SoundCloud, taking valuable show metadata along in the process. Sharing capabilities allow the show to be automatically posted on social networking sites. In this way, shows and reports can reach hundreds of listeners worldwide, immediately. "We are impressed with the number of visits and comments and the various statistics of the entire website," WADR station manager Peter Kahler says. Broadcast journalists outside of the studio can also produce and upload reports or shows to the Airtime server, adding their own metadata. As well as this, they can use mobile devices like mobile phones, tablets and laptops to stream live reports. These live streams can be picked up by the radio station and then be retransmitted. Another very useful feature is Airtime's JQuery widget, a box on the website that dynamically updates itself with the latest programme that is on-air. Here is a quick look at some of Airtime's features. The main feature of Airtime is the ability it gives you to schedule an audio programme using existing audio files, live shows and live internet streams. 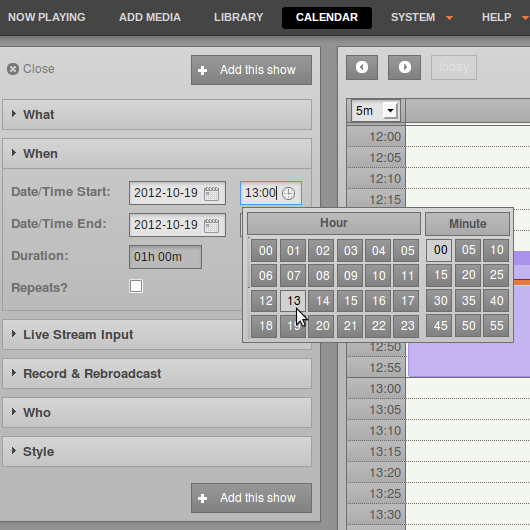 The scheduling interface is shown below. After recording a live show with Airtime, you can find the recorded file in the Library by searching for 'recorder'. The file will be labelled with a Title containing a date and timestamp, as well as the name of the show. Now click a file and select Edit Metadata from the pop-up menu to enter additional details of the recording. Then click the Save button. You can now send your live show to SoundCloud, with the metadata you have just entered intact. On the lower left side of the Stream Settings page, you can configure remote live input streams from the smartphone applications or laptops being used by your broadcast journalists. The Auto Switch Off and Auto Switch On checkboxes enable playout to be switched automatically. 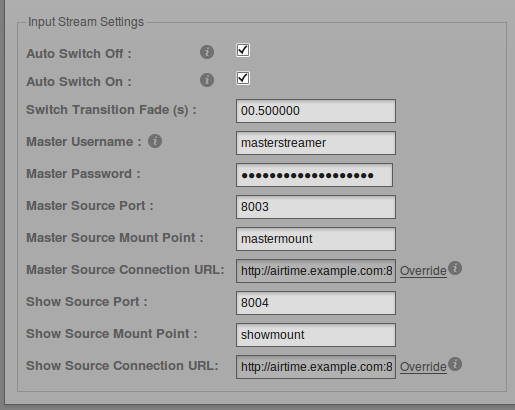 Airtime supports two types of live input stream: the Show Source, which enables a specific person to stream in during their own show, and the Master Source, which can override the Show Source if necessary. If you have checked the Auto Switch On box in the Stream Settings page, the Master Source switch will move automatically to the active position, on the left, when an authenticated master source connects to Airtime. Otherwise, you can activate the switches manually by clicking the left side of each switch, or deactivate them by clicking the right side.